While teachers have been recharging their batteries over the summer break, local government unions Unison, Unite and GMB have drawn up plans for a further co-ordinated strike on Tuesday October 14. Surely, as on July 10, the NUT must take strike action alongside these trade union colleagues again. 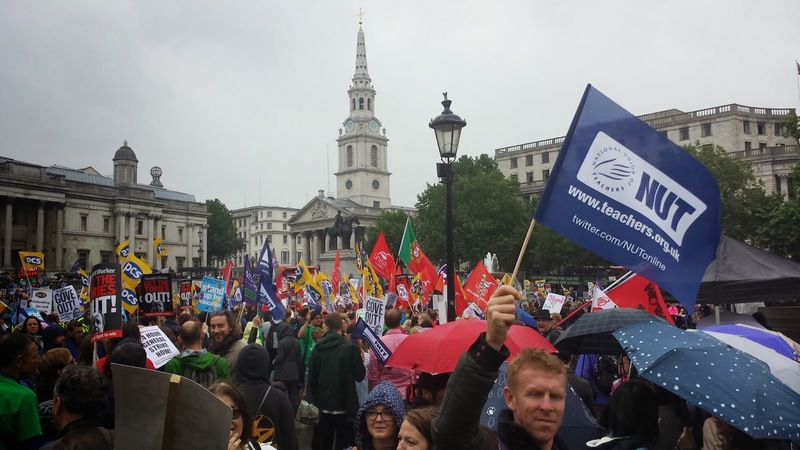 The July 10 strike had a significant impact with well-supported rallies in towns and cities across England and Wales. I don't think that it was any coincidence that, soon after, David Cameron decided it was time to ditch Michael Gove from his post as Education Secretary. That decision should give teachers renewed confidence that, with a clear plan of continuing action, we can force Cameron to change policy too - not just personnel. It was the mass co-ordinated strike of November 30 2011 that forced the Government to concede the limited - if insufficient - gains that we were able to make over pensions - such as protection for the over-50s. Further mass co-ordinated action provides the best opportunity to force further concessions from the government - particularly in the lead-up to the General Election. It is an opportunity we have to take. There are some in the NUT suspicious that, having seen Local Government unions pull back from continuing action after N30 2011, perhaps Unison, Unite and GMB can't be relied upon to maintain their latest battle on pay. Those doubts are reinforced by the bitter experience of failing to persuade the NASUWT to maintain strike action. However, if the NUT were now to be the union failing to join in action on O14, then it would be our local government colleagues' turn to feel let-down! Of course, every union has to consider the dynamics of its own dispute and develop its own specific action strategy but the chance of co-ordinating mass action needs to be taken when it presents itself - as on O14. Not to do so would not only weaken the NUT's hand, it would also undermine other unions, not least our support staff colleagues. Joint action by the NUT and support staff unions means colleagues can work together across the whole school - and close more schools through strike action as a result. Unions could work locally to build on the July 10 action - identifying less-organised workplaces that can be brought into action this time. This will be helped by reports that UNISON is seeking to extend its action to cover some of the academies that were not called out in July. With NHS workers balloting for possible action too, the NUT can play its part in making October 14 a significant day of mass action in protest against this Government's attacks. Is there any reason to doubt that the NUT would join in the O14 strike? Perhaps not - but the Union's position won't be clear until the NUT Executive meets again at the start of the new term on September 5th. The first complication is that the NUT has agreed, in line with a Conference decision, to carry out a consultative non-statutory 'affirmative ballot' of its membership at the start of the new academic year. At the July meeting of the Executive, the precise nature and timing of the survey was still unclear - as were the Local Government unions' plans for possible action at the beginning of the Autumn term. Christine Blower did indicate that it might be difficult to call on members to take further action while the Union was still consulting members on their views over the ongoing campaign. However, the fact that October 14 has now been called as a joint strike day must surely now be paramount - even if consultation on further strike action is still ongoing. Alternatively, the consultation could be issued so as to be completed in time for the NUT Executive to consider the results at its next meeting on October 2nd - still just giving time to call action on October 14th alongside other unions. The other danger is that, as I sought to warn in my General Secretary campaign, some in the Union seem happier if we prioritise lobbying and leafleting but perhaps make strike action a less significant part in the ongoing campaign. That would be a huge mistake. All aspects of the campaign are important but industrial action remains the key weapon for any Union. That's why, whatever decision is made over timing, it's vital that the consultation is framed in a way that encourages members to respond positively to plans for further strike action - including coordinated strike action as on 14 October. Officers and School Reps will have an important job to do in building support for a strong response to the affirmative ballot - and, hopefully, in preparing for joint action on October 14th. The Local Government unions' dispute is over pay, fitting in well with the TUC's 'Britain needs a pay rise' campaign - building for the national demonstration which will follow the strike on Saturday 18 October in London. The NSSN will also be holding its now regular Lobby of the TUC Congress, this year in Liverpool on Sunday September 7th. A rally under the theme ‘Keep striking together for a pay rise!' will be held at 2.00 pm in the Jurys Hotel, opposite Echo Arena Conference with speakers including Mark Serwotka, PCS General Secretary. Our school-leavers and other workers in our local communities are all being squeezed by a determined attempt by the Tories to shift wealth from working people to their rich backers. This week, the Guardian reported that UK wages have actually fallen for the first time since the 2009 recession (http://www.theguardian.com/business/2014/aug/13/fall-uk-wages-bittersweet-rising-employment). Teachers are in dispute over workload and pensions as well as pay - but all of those factors are linked. With pension contributions increased, annual awards again held beneath inflation, and pay-progression starting to be denied under performance-pay regulations from this September, teachers are under even more pressure to work ever-longer hours to show their 'performance' is worthy of a pay-rise. The NUT has rightly refused to accept these attacks. Now is not the time to back away from our campaign of action. Now is the time to escalate our campaign to make sure we defeat them - starting with joint strike action on October 14.